Here's the 10th sale in March as Bob Cury at RJC Yachts tells me that David Wiest closed on the sale today of the 46m motor yacht Status Quo with Merle Wood & Associates acting for the seller. Built to ABS class and MCA compliant by Richmond Yachts in April 2010, Status Quo accommodates 10 guests in a full beam main deck master suite, three double staterooms and a twin cabin. She features large entertainment areas, formal and alfresco dining and a massive sundeck. 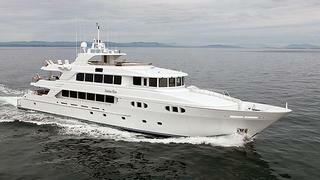 Status Quo was asking $19,995,000 and, renamed Excellence, joins the RJC Yachts charter fleet.